We had at least 15-18 shorts (lost count on the exact number) with 2 keepers on Saturday’s trip but we had less than 2 hours of decent fishing conditions. Most of the day the lines ran sideways, under the boat or up to the bow as we had incoming tide against the strong NW winds that blew between 20-25 knots most of the day. The boat swung back and forth all morning and as my crew refers to conditions like this as the windshield washer effect and we hardly ever catch when the wind overpowers the tide. Today the conditions were drastically different than on Friday’s trip when the lines went straight out the back of the boat and we had action on nice size keepers throughout the whole incoming tide. It was just one of those cool windy days that make anchoring and chunking very difficult. 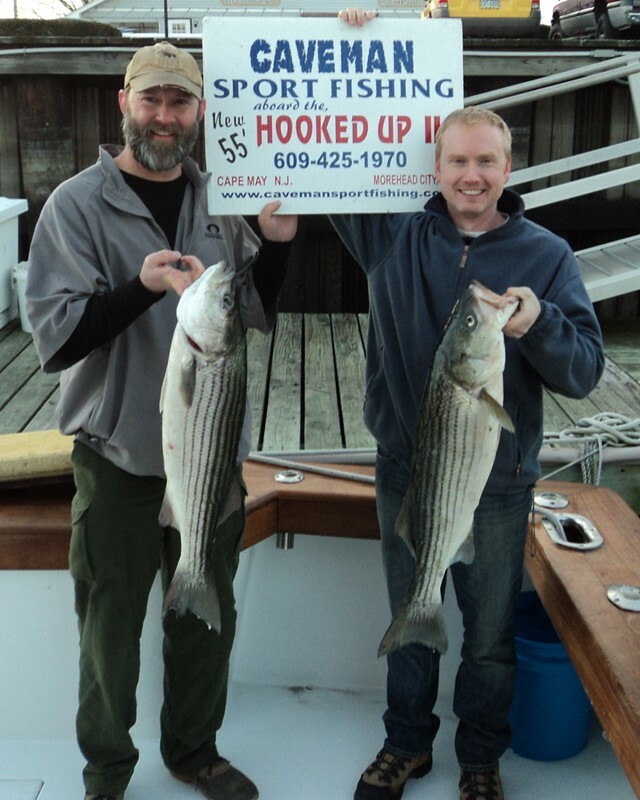 The good news is there are plenty of stripers in the Delaware Bay right now as we saw more of them on our fishfinder than we did on Friday’s trip when we had our limit and released at least 5-6 others. On another positive note is we have had only a few doggies on our last couple of trips and we were fishing in deep water. A few weeks ago we fished the same location and it was all doggies. Similar to Friday’s trip all the stripers were loaded with sea lice and it appears they have just recently entered the lower bay after being out in the open ocean or rips. My personal opinion is the striper season is far from over and there are some really nice ones in the 20-40 lb. plus range in the Delaware Bay and all we need is some decent weather and we will be back out on the bay striper fishing. If you would like to join us we have plenty of dates available in December including this coming weekend. We will post upcoming open boat trips once the weather improves later this week. FYI – We also heard the troll bite in the open ocean was also good today!